Palladium is about half as expensive as platinum, with many of the same desirable characteristics: superior whiteness, greater purity and better working properties for gemstone setting. Palladium is hypoallergenic. Nickel, a major component in white gold alloys can cause allergic reactions. Our palladium alloy contains no nickel and is therefore ideal for those with sensitive skin. 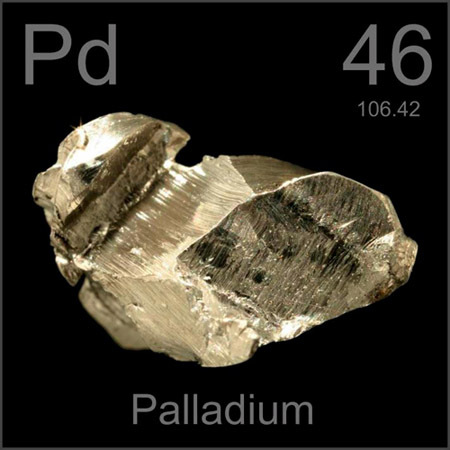 Palladium is identical in color to platinum and whiter in color than 14K and 18K white gold. Palladium is a lustrous silver-white metal that resembles platinum. It was recognized as a distinct element in 1803 by William Wollaston. Beginning in 1939, palladium has been used for jewelry. Recent improvements in alloying technology, coupled with the increase in platinum prices make it an excellent, affordable choice for today’s fine jewelry. At Equinox, our palladium jewelry is made from an alloy that is 95% pure palladium. Platinum alloys are either 90% or 95% pure, depending on the specific application. Compare these ratios to 18 karat gold, which contains 75% pure gold and 14 karat gold, with only 58.5% pure gold. 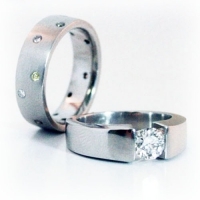 Palladium has a natural white luster and is essentially identical in color to platinum. At a cost equivalent to white gold, palladium has many advantages and is well worth considering as the metal for your next purchase of fine jewelry.